Q1. Where Can I purchase Fuji Impulse products, parts, accessories and associated packaging materials? Q2. Where can I get a price quotation? Q3. Can I purchase the consumables in smaller quantities? Q4. Did I receive a wrong-size Teflon sheet? Q5. Are there any bags that can be sealed and bags cannot be sealed? Q6. What is the “Standard Sealing”? What about “Melt-Cut Sealing” or “In-Between Cut” Sealing? Q7. Do the model names have any meaning? Q8. What is the Fuji Impulse sealer made of? Q9. What is an ejector? Q11. Would having a longer heating time and/or a higher heating temperature make the seal stronger? Q12. Does the dual heating model seal faster and stronger? Q13. Can we make the cooling process shorter? Q14. Why won’t the heating element heat up even when the switch is turned on? Q15. Do we really need to equip the sealer with Teflon sheet and glass tape? Q16. Is it possible to install the heating element with the different width? Q17. Fi Series: The heating element doesnft heat up even when the operator steps on the pedal. Is it broken? A3. While some consumables are not sold in smaller quantities like one or two pieces, we do have gmaintenance part kith that comes in quantities considered to be appropriate for one order. Discounted rate is applied for the kit price from the standard piece price. Please note that kit price is not available for all sealer models. In our efforts to meet customer requests, we offer two choices, 10 heating elements or 20 heating elements per set. (*)NOTE: For the dual heating type Fi and FA-200 series includes 3 heating elements. A4. When customers purchase only Teflon sheet for replacement (without Teflon sheet winding rod), we frequently hear customers saying the size of the sheet does not fit well at the time of installation, in particular, the width. The Teflon sheets we sell are rectangular-shaped, with its width being the length of the seal for each model (see “A” in the figure below) and its length being the direction in which the sheet is rolled-up toward the roll bar (see “B” in the figure below). If we were to ship the sheet rolled up in the same direction as the sheet would actually be rolled up into the sealer, some rolls of sheet for longer-seal models would be 45 to 60cm long, or even 1M for very large sealer models. This would require a very long tube packaging, which is expensive to ship and it would also increase the risk of being bent during the shipment. For these reasons, we ship our Teflon sheets for longer-seal models by rolling them up starting with the shorter width (“B”). 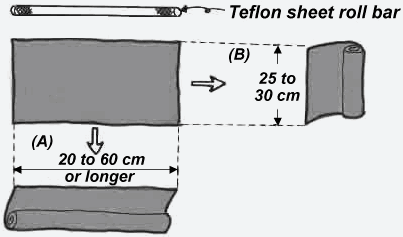 When you receive Teflon Sheet, please unroll it completely first, find which side matches the length of the seal, and then roll it up with the rod accordingly. Laminated bag: A bag made of multi-layered plastic films. Sealable with Fuji Impulse sealers. Aluminum bag: A bag made of both aluminum and plastic film layers. The plastic film layer is inside of the bag so the bag is sealable with heat. Aluminum bags are often found as tealeaf bags, coffee bean bags and etc. Some bags shown above might not be sealable depending on the combination of the film layer. Please contact Fuji Impulse America if you would like to test your films or bags to verify the successful results. Fuji Impulse sealers cannot seal bags that do not have the plastic film layer such as paper bags. However, there are some bags that look like paper bags but actually have a plastic film layer inside. As the plastic layer melts with a heat, these paper bags are sealable. Please note that paper bags are vulnerable to heat and easy to get burned without proper heating. ONPUL is designed to provide stable heating to guarantee clean and solid sealing performance at all times. Standard Sealing: Sealing process to heat-seal two or more plastic films through a flat-shaped heating element. In this case, we recommend to put the glass tape on the heating element to prevent the sealing area from burning. P-200, PC-200, P-300, FS-215, FS-315 etc. In-between cuts: Sealing & Cutting process to provide both “Standard Sealing” and “Melt-Cut Sealing” at one time to make bags. Type 5C and 10C use a cutting heater to cut through the centerline of the sealing area. 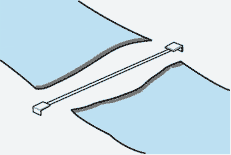 10C Type: Cut the heat-sealed area through the centerline, making 2 x 5mm standard sealing. This is often used in bag-making operation. 5C Type: Cut the heat-sealed area through the centerline, making 2 x 2.5mm standard sealing. This is often used in bag-making operation. A7. For your reference, the following are the meanings of the main model names. The model names represent the specifications of the machine, in the order shown below. However, due to some confusions caused by this, we are looking into a new naming method for our new products to be launched in the future. A8. Fuji Impulse sealers’ pressure levers and sealing frames are made of aluminum. Aluminumfs feature of high heat-conductivity helps release heat from the pressure lever and the sealing frame during the impulse sealer’s cooling process to solidify the film. If you have never touched aluminum, try touching it. You will like it in the summertime when the weather is hot and the coolness is appreciated, but in the wintertime, the coldness may be a bit too chilly! A9. Vacuum sealers that have “NTW” as part of their model names use ejectors to vacuum air from the bag. 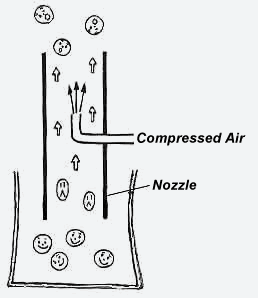 As shown on the right, an ejector takes advantage of the phenomenon of when compressed air is sent through the pipe (in case of our products, the nozzle), all the other air in the pipe gets pushed out in the same direction. The vacuuming speed using the ejector is three times faster than that of vacuum pumps, but the ultimate vacuum by the ejector is about one half of what the vacuum pump achieves. Therefore, ejectors are appropriate for use when you are looking for high speed instead of high vacuum during the vacuuming process. In addition, because the contents that are vacuumed through the nozzle can be discharged or released directly outside of the device of the machine, ejectors are suitable for vacuum sealing powders and liquid. On the other hand, when complete vacuum and gas-replacement must be ensured, ejectors are not suitable. Please refer to our “What is an ONPUL sealer” page for the detail. A11. No. The sealing strength increases only when the packaging material melts at the right temperature, with an appropriate sealing pressure and a sufficient cooling process. Thus, just making the heating time longer and applying higher heat does not contribute to the sealing strength. The appropriate heating time and heating temperature depends on the type and thickness of the packaging material. Please minimize the heating time and the heating temperature when in use. Before proceeding to the sealing operation, please set the machine to the appropriate heating and cooling settings for the materials being used. A12. No. While it is true that the dual heating type sealer may increase the sealing temperature, it does not necessarily mean that it will shorten the sealing time, especially for the impulse heat-fusion sealers. The two heating elements constructing the dual heating sealers are set to a lower temperature than that of a single-heating sealer, and its upper heating element is padded with a silicon rubber, which is resulting in a decrease of heat conductivity and an inefficient heat-release and cooling process. A dual heating type sealer takes as much time as a single-heating type sealer to heat, but the cooling time is longer, resulting in a slower overall sealing cycle. The dual-heating type sealer is suitable for gusset bags, requiring a thicker film sealing. The upper heating element is padded with rubber to enable the sealing of gusset bags. In a dual-heating type sealer, the upper heating element has lower heat conductivity and reduced heat-release and cooling effects, requiring a frequent replacement of the element. We recommend replacing the upper heating element five times as often as the lower heater. A good rule of thumb when using the sealer for 500 bags a day is semimonthly replacement of upper heating element. Please perform maintenance to avoid sealing failures and other problems that may lead to mechanical malfunction. For the above reasons, we recommend choosing a single-heating type sealer instead of a dual heating type sealer for gusset bags under 0.08mm thick. A13. T he answer is: DO NOT shorten the cooling time more than necessary. With an impulse sealer, cool down the frame and pressure lever in the closed position after heating. Without sufficient cooling time, the film of the sealed area may shrink or being cut. For the tabletop models such as P/ PC and V-300 series, you can hear the beep when the heating and cooling processes are complete. With the sufficient cooling time, the seal made by the impulse sealer is much more beautiful and stronger compared to a constant heat sealer that keeps the sealing area hot at all times. A14. We often hear our customers ask, “The heating element wonft heat up several minutes after the power switch (or the breaker) has been turned on. Is it broken?” Impulse sealers heat the heating elements instantaneously after the sealing process begins. This means that the heating element will not heat up after the power switch is turned on until you proceed to the next step. It is not broken. The machine is only in idling mode and “gready-to-go” status when the power switch is turned on. A15 . Yes. Each of the so-called consumables that attaches to the heaters has a different purpose described below. They are all important parts of a Fuji Impulse sealer. If they are not properly attached, failure and/or electric shock may occur. In addition, the resulting seal may not be clean. 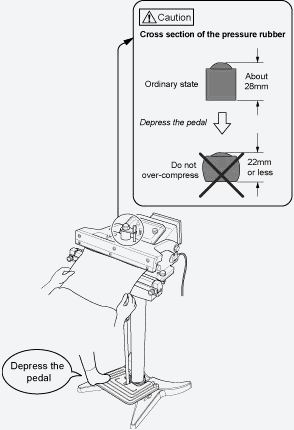 Please ensure that they are properly attached as configured in the illustration on the right. What are the important role(s) of five key consumable parts. A16 . We often hear our customers ask, “Is it possible to install the different-width heating element?” The answer is “NO”. For instance, the last digits “10” of the model name “FA-300-10″ indicates that the machine is for the 10mm-width heating element. This machine does not allow heating element width other than 10mm. This is because the machine is designed to accommodate with other key built-in electric components such as transformer and electrodes and incorporated into the system. Ignoring this will lead to the malfunction of the machine or fire due to over-heating. Please keep this in mind and select the best-fit model for your unique conditions before you purchase the sealer. If you would face with a different sealing width for a different application in the future, please consider to use another (or new) unit to meet your new condition(s). Some sealer models have a standard built-in feature to allow interchangeable heater elements between two different sealing widths. Please refer to the following chart for the detail. A17 . Customers who have newly purchased a Fi-series foot-operated sealer often asks if the machine is broken because the heating element does not heat up and the material cannot be sealed even when the operator steps on the pedal. In most cases, this is caused by the pedal not being pressed down sufficiently. Please step on the pedal further down until you hear the clicking sound that indicates the microswitch kicks in and you see the heating indicator light turns on. Stepping too hard on the pedal, however, could cause the damage to parts such as the micro-switch. Be careful not to step on the pedal too much so that the height of the pressure rubber as shown below is compressed to 22mm or less.